No other biblical book ascribes such a prominent place to the theme of ‘Zion’ as the book of Isaiah does. 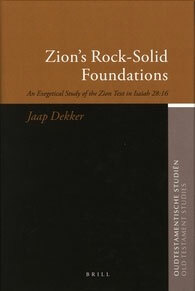 One of the most important statements regarding Zion is to be found in Isa. 28:16. The text speaks of the laying of a foundation stone in Zion and enjoys an important place in New Testament preaching since it is associated with the advent of Jesus Christ. The present study addresses the interpretation of Isa. 28:16 in its Old Testament context. Its significance lies in the fresh contribution it makes to our understanding of the Zion text in question and its importance for establishing the role played by Zion and the so-called Zion tradition in the preaching of Isaiah.